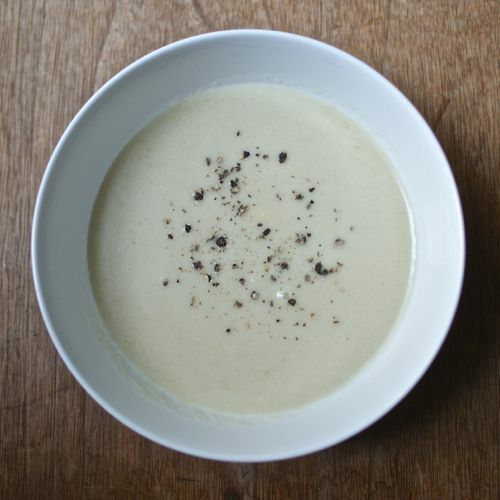 This simple soup is made of just cardoons and onion in broth with a bit of cream, but the taste is much more complex thanks to the part-artichoke, part-celery, part-potato flavor of the cardoons. Note that cardoons have a sharp tannic edge and even some bitterness to them, much like artichokes. Cardoons vary greatly in how bitter or tannic they are, and people vary greatly in their tolerance of it. Some people may prefer to blanch the cardoons first and drain them before proceeding with the recipe. Trim and peel the cardoons, being sure to pull out the large stringy fibers. Seriously, despite any temptation to the contrary, do not skimp on the trimming step! Put the lemon juice or vinegar in a large bowl of cold water. Put the cardoon pieces in the water as you cut them (this will limit browning). Peel and chop the onion (the soup is getting pureed, so general semi-evenness of chopping is more important than exact size). Melt the butter in a medium pot over medium-high heat. Drain the cardoons, rinse them with cold water, and add them to the pot. Add the broth, bring to a boil, reduce the heat to maintain a steady simmer, partially cover the pot, and cook until the cardoons are very tender, 45 to 60 minutes. Yep, it's sort of a long time, but an undercooked cardoon won't puree into a lusciously smooth soup and won't taste good. Working in batches, whirl the soup in a blender until smooth. If you have a hand-held immersion blender, this is a great time to bust it out and put it to good use. Note that for a smoother, more refined texture, you'll need to run the soup through a sieve or food mill. No matter how much you blend it, the fibrous nature of cardoons is near impossible to diminish without straining of some sort. Return the soup to the pot and warm over low heat and stir in the cream. Serve hot garnished as you like.